Digital Electric TENS / EMS Stimulator : 3-in-1 Technology: Beauty, Sport, Massage. LCD provides a high contrast display for easy reading. Smart contact detection ensures all electrodes are attached properly. Body map indicator creates a manual-free interface. Doctor’s Function - A specific setting allowing immediate recall of a program reccomended by your physician when the device is powered on. 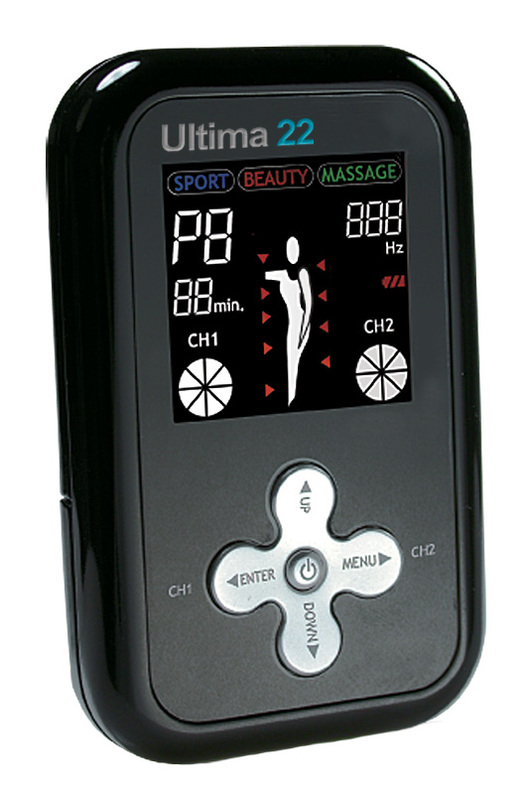 ULTIMA 22 : Digital Electric TENS / EMS Stimulator : 3-in-1 Technology: Beauty, Sport, Massage. A dual channel device with 30 preset treatment modes. This device is remarkable for its body part specific settings, and for ease of application and set-up by the patients. TENS works by stimulating your body's own natural defenses against pain. The unit produces a gentle stimulation through pads normally placed over the area of pain.This stimulus helps the body to produce natural pain relievers called endorphins. The correct positioning of the pads is important. Some people feel immediate benefit from TENSHowever, some may only achieve benefit after repeated treatment sessions and over an extended period of time. The Ultima 22 features 3 modes, each mode containing 10 presets, providing a wide selection for users maximum comfort. Each preset displays the intended target area on the body map indicator, making it easy to determine if your electrode placement matches your intended preset program. SPORT – We provide the most common and effective parameters after years of feedback from market. Through specific programs and parameter presets, this mode delivers either muscle toning or relaxation. Programs under sport mode refer to the most common parameters for pain relieving and training. BEAUTY – Gentle applications provide sculpturing, shaping, lifting, and firming to particular regions such as hip, waist, thigh, and upper arm. Programs under beauty mode focus on thigh, waist, and hip for maximum body sculpture and comfort. MASSAGE – Integrated masseur technology provides solutions for pain relieving, muscle relaxation, and promotes circulation. The Ultima 22 also offers the possibility of reducing muscular tension and combating fatigue symptoms using a program based on real massage in terms of sensation and effect. Using the positioning suggestions and program charts inside the device manual, you can determine the device setting fast and easily for the respective application. Through the two separately adjustable channels, the Ultima 22 has the advantage of adapting the intensity of the pulses independently of each other or two parts of the body to be treated, for example in order to cover both sides of the body or ensure even stimulation or larger areas of tissue. The individual intensity setting of each channel also allows you to treat two different parts of the body at the same time, whereby it is possible to save time compared with individual sequential treatment. WARRANTY and WARNINGS : 1-year, no-questions-asked warranty against all mechanical defects.